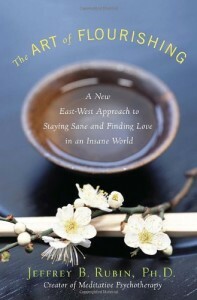 What do you get when you blend eastern philosophy with western psychology? A book called The Art of Flourishing by Jeffrey B. Rubin. For those unfamiliar with his work Jeffrey Rubin is the creator of meditative psychotherapy whose previous books include Psychotherapy and Buddhism, The Good Life and A Psychoanalysis for Our Time. The Art of Flourishing can be broken into two separate halves. The first half of the book deals with the self – “Planting The Seeds of Self Care”, while the second deals with building strong(er) relationships – “Cultivating The Garden of Love”. While these headings may sound a little flowery (excuse the pun) the language used in the text of book is much more direct. A common pitfall for these kind of books is a sense of “preachiness” as you turn the pages. It’s a pitfall that The Art of Flourishing manages to avoid thanks to the author being willing to admit to his own mistakes and flaws. Rubin writes passionately about various topics in the book including inner space, listening to the mind and body, passions and purposes, values, love and the use of power. He uses the tried and tested method of point, evidence, explanation to get his thoughts across to the reader. In chapter 6 “Following Our Passion” Rubin discusses the importance of finding and following a healthy passion using the example of John Miller, a 74 year old jewelry artist. John had quit a lucrative job to follow his passion of stonework. John took a risk and succeeded, on his own terms, and it’s these kind of stories that inspire the reader as they read on. If you’re looking for an uplifting read that will give you the chance to look at your own life and see what needs working on then I fully recommend that you pick up a copy of The Art of Flourishing. It does not tell you what to think – it teaches you how to think – and I can’t think of much higher praise than that. The Art of Flourishing is available from Amazon and all good book stores.